In the Dec. 27 “Year In Review” edition of the Bayonne Community News, we mistakenly wrote that the City of Bayonne’s animal control contract with NJ Animal Control and Rescue was severed. The city allowed the contract to expire after Liberty Humane Society entered a lower bid in response to the city’s request for proposals. 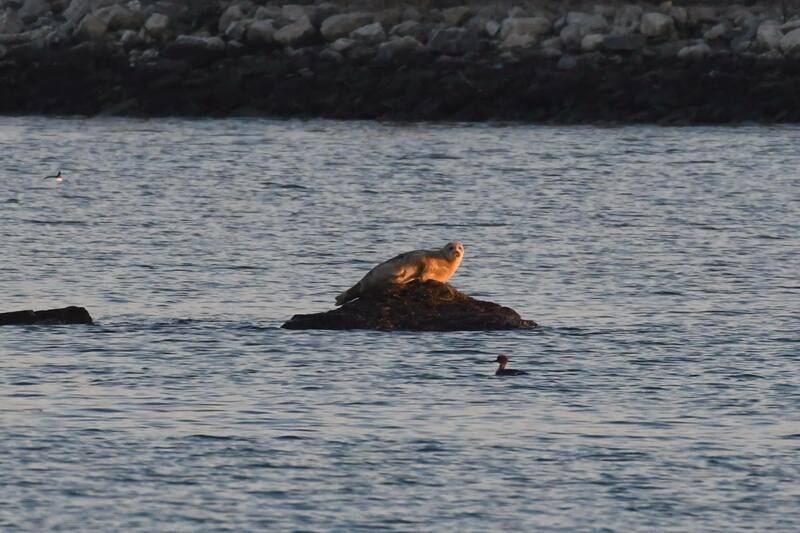 A seal was spotted by local naturalists last week sunbathing on a rock near South Cove Commons. Seals have also been spotted off the coast of Liberty State Park. Their presence is a sign that water conditions are improving. A huge population of seals up north travel south during the late fall, winter, and early spring. The seals feed on crustaceans, squid, shellfish, and a variety of fish, which are evidently and increasingly ample in New York Harbor. Their big eyes and generally playful demeanor often fascinate onlookers, but don’t get too close. The Marine Mammals Protection Act of 1972 makes it illegal to come within 100 yards of a seal. The Bayonne Police Department is investigating a reported theft at the John T. Brennan Fire Museum on 47th Street between Broadway and Avenue C. Details of the incident are unclear; the museum declined to issue an official statement. Sources familiar with the incident said that historic artifacts, such as fireman badges, were stolen and sold on the internet. No charges have yet been filed. Pam O’Donnell, whose 5-year-old daughter, Bridget, and husband, Tim, died in a car accident in February of 2016, won the right to sue the NJ Turnpike Authority (NJTA), according to a NJ Supreme Court opinion issued last week that cited “extraordinary circumstances” that should allow a delayed notice of tort claim to be filed. The 18-month court battle started after O’Donnell’s former attorney failed to send notice of tort claim to the NJTA within 90 days of the crash. O’Donnell sought to sue the NJTA for negligence. On February 22, 2016, Tim O’Donnell was driving on the NJ Turnpike Hudson County Extension when he was rear-ended, sending him and his 5-year-old daughter into oncoming traffic and colliding head-on with an ambulance. Bayonne firefighters extinguished a one-alarm fire at Bayonne Dry Dock on the former Military Ocean Terminal Base at around 7:20 p.m. on Jan. 17, according to Bayonne Fire Department Chief Keith Weaver. Firefighters extinguished the fire in about 40 minutes, preventing the spread to other containers. No injuries were reported. The incident remains under investigation. The Jersey City NAACP installed its new leadership at the Wallace Temple A.M.E. Zion Church on 17th Street and Avenue C on Jan. 13. The officers are President the Rev. Nathaniel B. Legay, First Vice President Marion Moody, Second Vice President Kevin Armstrong, Third Vice President Chanel N. Gordon, Secretary Phyllis Gordon, secretary, Assistant Secretary Paulette Gordon, and Assistant Secretary Brian Hankerson. Delivering the keynote speech was the Rev. Alonzo Perry, pastor of New Hope Missionary Baptist Church in Jersey City. Selected from thousands of entries nationwide, Bayonne High School was named the New Jersey state winner in the Samsung Solve for Tomorrow Contest for its proposed plan for a firefighter robot. The contest encourages teachers and students to solve real-world issues in their community using classroom skills in science, technology, engineering and math. Led by BHS math teacher, Steven Fung, students are currently working to create a prototype of the firefighting robot. Bayonne High School is among the nation’s 50 state winners (representing all 50 states) and will receive $20,000 in technology for its achievement. The school will also receive a Samsung video kit to create and submit a three-minute video showcasing their project development and how it addresses the issue in hopes of advancing to the next phase of the contest and win additional prizes and educational opportunities. Ten national finalists will be selected to attend a pitch event in the spring where they will present their project to a panel of judges. For achieving national finalist status, 7 schools will receive a $50,000 technology package. The other three will progress to the national winner stage. Years of advocacy has paid off for millions of NJ residents who will see their wages rise steadily over the following five years after Gov. Phil Murphy signed legislation raising the minimum wage in the state to $15 per hour. The current minimum wage is $8.85 per hour. The bill mandates the minimum wage to rise $10 an hour on July 1, then to $11 on Jan. 1, then by $1 an hour every year until it reaches $15 in 2024. Trade groups across the state opposed the effort, claiming that higher wages will be burdensome on business owners and could result in job cuts. More than 780,000 minor court warrants statewide are now dismissed, thanks to a New Jersey Supreme Court ruling on Jan. 17. The order also requires the court to form a committee to review and dismiss municipal court issues that remain unresolved. To learn whether your case qualifies, visit njcourts.gov. Charges not included in the order include indictable charges, disorderly persons charges, petty disorderly persons charges, and several motor vehicle charges, including driving while intoxicated and passing a stopped school bus. The partial government shutdown has prompted nearly 500 of the 6,700 federal employees working in New Jersey to file for unemployment benefits from the state. Officials say there’s no guarantee that furloughed workers will receive back pay once the shutdown is over, and contractors won’t get paid for lost hours. For most, Jan. 18 will be their first day without a paycheck. A national survey of high school students — 425 in New Jersey, 86 percent in public schools — has found that despite the state’s 2011 Anti-Bullying Bill of Rights Act, many LGBTQ students continue to feel unsafe at school. 20 percent faced physical harassment, and 9 percent were assaulted in the previous year. Forty-eight percent of trans students couldn’t use a bathroom matching their gender identity, according to NJ Spotlight. Suez North America has announced that 16 out of 108 homes it tested across Hudson and Bergen counties revealed elevated lead levels in drinking water. It’s unclear how many homes are affected, though the problem is likely related to service lines in homes built in the early 1900s, which cost $3,500 to $6,000 to replace. Hudson County municipalities affected include Secaucus, West New York, Weehawken, North Bergen, and Union City. Bayonne was not on the list. Though NJ Transit’s budget is in flux, its board has approved a $65.8 million order for 85 new-fangled buses: they’re articulated, with USB charging ports, according to The Record. All the buses are expected to be on the road by Dec. 2020. Last month, NJ Transit’s board ordered 113 commuter rail cars for $669 million. A draft proposal for how the state should put environmental justice into practice is now open for feedback. Email comments are accepted until March 22: eo23@dep.nj.gov. The state DEP will also hold listening sessions. The process began in April, with Gov. Phil Murphy’s Executive Order. A 31-year-old 19th Street resident who was arrested in November after a bullet hit a Bayonne home between Kennedy Boulevard and Avenue C pleaded guilty to gun and drug offenses last week and will be sentenced by the Hudson County Superior Court in February. Joshua Arroyo was charged with gun offenses involving an assault rifle, an AK-47 and a high-capacity magazine, and drug offenses involving marijuana, heroin, cocaine, and prescription drugs. He will spend at least three and a half years in prison as part of a minimum seven-year sentence. Last week, Arroyo pleaded guilty to unlawful possession of an AK-47 and possession of ecstasy with intent to distribute.